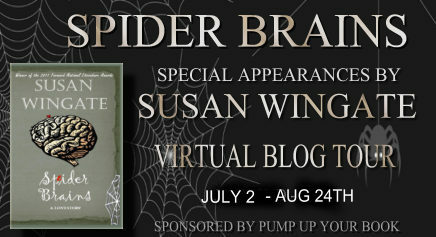 Most recently, Susan Wingate’s novels, SPIDER BRAINS and DROWNING each reached Amazon Bestseller status in 2012. DROWNING won the 2011 Forward National Literature Award for Drama. She would love for you to read her books. You can find them all under the tab on this site labeled “Books”. 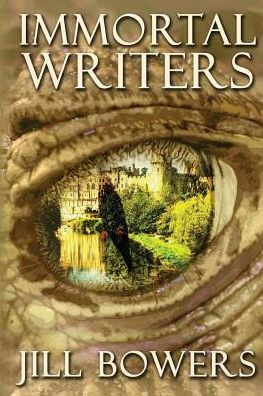 SUSAN has written eleven novels, two short story collections, a few plays, one screenplay and tons of poems. 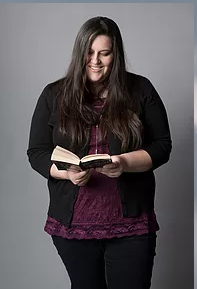 Her latest 2011 novel DROWNING (contemporary women’s fiction), won 1st place in the 2011 Forward National Literature Award and also won a finalist award for the category of Women’s Fiction/Chick Lit in the 2011 International Book Awards. 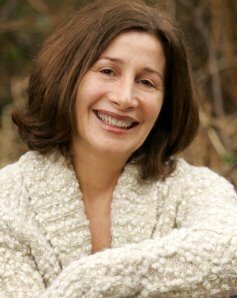 A vibrant public speaker, Susan offers inspiring, motivational talks about the craft of writing, publishing and marketing, and how to survive this extremely volatile (e-)Publishing industry. She presents these lectures for private groups and at writing conferences, libraries and bookstores around the country. Thank you for joining us today, Susan. Can you please start off by telling us a bit about yourself? Absolutely! Well, I love animals and always seem to include them in my writing. I live on a small island off the coast of Washington State where we have a beautiful country home that sits on five acres of lush earth. A large pond brings lots of wildlife to our spot. We see Great Blue Herons, bald eagles, mallards, wood ducks, fox, raccoons and herds of deer. As well, I have two dogs–a Cocker Spaniel named Rocky and a Westie named Robert. And, don’t cringe but we have twelve cats! That’s a bunch but they all came to me as feral cats (wild cats) from around this rural landscape on which we live. Now, they’re all quite tame, fat and happy! We also have fourteen birds–cockatiels, doves and pigeons. Obviously, my husband loves animals (and me) too. My father was a writer and I remember him reading to us his work way back when we were just small children. His bachelor’s degree was in English and he minored in speech. So, we always had reading in our lives. He influenced me a great deal. I think I’ve always hoped that one day I might write like him. He usually wrote these fun adventure stories with tons of humor. But it wasn’t until I was thirty-nine when I began to take my writing seriously. At that point, I believed writing would be my future. I write both adult and juvenile fiction but with juvenile fiction I can explore the relationship between human beings and other animals. And, even more so with juvenile fiction, where I can bring to life animals who think, feel and act much like humans do. There are several studies that prove animals as being sentient beings, feeling and sensitive beings. I give this notion legitimacy in my stories. But I also like to explore the human condition. For instance, some of my stories like SPIDER BRAINS touch on other serious topics such as Attention Deficit Disorder (ADD) and the treatment of ADD. SPIDER BRAINS also deals with the topic of death and loss, hope and redemption. I’m not sure that either–adult fiction or juvenile fiction–is more difficult to write than the other. There may be different considerations for each but writing novels, no matter the genre or age, entails the same amount of work. A writer must to come up with a viable idea. A writer must create some sort of road map for the idea. In my case, I develop an outline. And then a writer must log 50,000 words and up, all that will hold a reader’s attention. Another point for this question is that SPIDER BRAINS almost fell into my lap. Literarlly! I explain this point further in just a few more questions. I think nailing the younger characters in each story, in voice and style and action. Young people speak differently than adults and usually with tons more emotion. They talk with their entire bodies–they roll their eyes, flip their hair, make strange sounds when they need to add emphasis, they do this full-body-slump when they’re upset. For me, young people are more interesting to observe because they hold nothing back. SPIDER BRAINS: A LOVE STORY tells the story of fifteen-year-old Susie Speider. She sees herself as a nerd and she’s a word freak. One night while Susie is lying in bed trying to sleep, she notices a spider traversing her ceiling. After getting a closer look at the spider and feeling as if they’ve bonded, she puts her finger next to the creature to see if it will climb aboard in order for Susie to put it outdoors. Well, one thing leads to another, as they say. 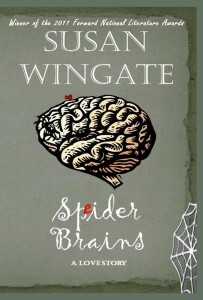 What inspired you to write SPIDER BRAINS? One night in bed, I noticed something strange. It was very early in the morning. My husband had gotten up for work and flipped on the bathroom light switch. The brightness shone against the ceiling and there, not too far from the bed, was a spider making its way across the ceiling. I thought about retrieving it and then setting it free outside but before I could set one foot on the floor to do so, a story flashed across my mind. For about an hour I wrote notes covering the over-arching idea which resulted in the novel SPIDER BRAINS. The paperback for SPIDER BRAINS can be found at bookstores and on Amazon.com. 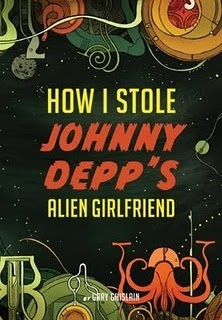 People can also buy the book directly from the publisher, Roberts Press at http://www.robertsbookpress.com. Well, right now, I’m working on two novels. One is the 2nd book in the Susie Speider Series. The second is in a new genre for me. It’s an apocalyptic thriller. It still falls into the category of Young Adult but the apocalyptic thriller will be new for me. I’m having tons of fun writing that one too. I just want to say thank you for having me on your great blog. It’s quite an honor for you to spend your valuable time featuring me and SPIDER BRAINS. So, thank you very much! It’s been a pleasure answering all of these great questions. Thank you for spending time with us today, Susan. We wish you much success. Joining us today is David Stahler Jr., author of the YA novel, Spinning Out. 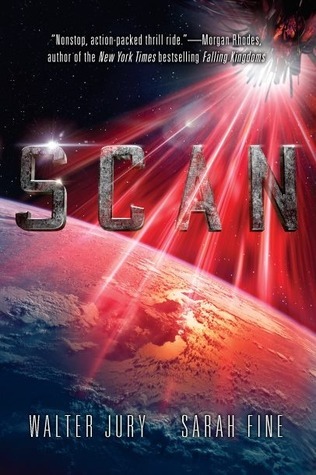 Read to the end of this interview to see how you can win a Free copy of this book. Thank you for joining us today, David. Can you please start off by telling us a bit about yourself? I live in the hills of the Northeast Kingdom of Vermont, where I was born and raised. I’m closing in on forty. I teach AP English at my alma mater, Lyndon Institute. I married my college sweetheart, whom I met when I was nineteen. I have a nine-year old son named Julian and a four-year old daughter named Maida. I love playing my Scottish smallpipes, listening to indie rock, hunting deer in the fall, and playing dorky boardgames with my friends. I’d done a little writing as an undergraduate at Middlebury College, working with the writer Jay Parini. But it was during my master’s degree program at Dartmouth where things clicked. I took a fiction-writing course with the author Craig Nova, then worked with him on my thesis, which turned into the novel Truesight. It was during this time when I realized I could actually do this whole writing business. To be honest, I sort of stumbled into the career. I was never one of those people who pine their whole lives to be a writer. I still don’t know if that’s a good or bad thing. Again, I didn’t set out intentionally to write YA fiction. It just happened that the stories I found myself wanting to tell ended up having young adults as the main characters. Maybe it has to do with the fact that I’m a high school teacher. It certainly helps, anyway, to be tuned into that consciousness on a daily level. It’s hard to answer that question, because I never think of myself as writing FOR that particular audience. I just have a story to tell, and I tell it the way I’d want to hear it if I were on the other end. With few exceptions, I think adults could get just as much enjoyment as teens from reading my books, or any YA novels for that matter. It’s exciting that a lot of people are starting to realize this. The crossover audience for YA fiction is exploding right now. In terms of your question, I guess I would say that teenagers are full of passion, of both the light and dark variety, which can make things easy and sometimes difficult in terms of telling a story. Spinning Out is about a lot of things, but at its heart it’s a buddy story. What do you do when your best friend falls apart? And how do you handle it when you’re also dealing with your own upheavals and trying to discover who you are and what you’re going to do with your life? The narrator Frenchy is a kid who’s the perennial sidekick who ends up coming into his own and surprises himself in the process. It’s a bittersweet tale. It’s funny because I can pretty much remember where the ideas for all my books came from except this one. I came up with the idea seven years ago, then tucked it away into the back of my head and ruminated on it for about five years before putting it to paper. The usual places—online at Amazon and B&N, as well as bookstores with discriminating taste. Not yet, but I’m finally going to break down and join the world of social networking this summer. Look for it in July! I’m hard at work on a real genre-blending project—a gritty, futuristic, supernatural tale that involves reincarnation and a young woman’s struggle against an ancient enemy. It has all these framed narratives from different periods in history mixed with elements of horror. It’s been exhausting, but I’m very excited about it! 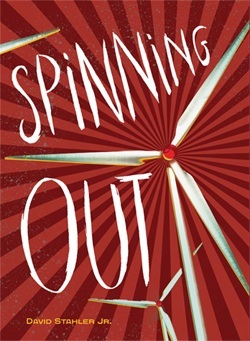 Spinning Out taps into a lot of contemporary issues (teen mental illness, wind turbines, returning veterans with PTSD) and has some pretty heavy moments, but it is also a very funny novel. I think there’s something in it for everyone to enjoy. Thank you for spending time with us today, David. We wish you much success. Contest is open to residents of the United States only. Deadline for entries is 11:59 PM on July 10, 2011. A winner will be selected from all correct entries received. The winner will be notified by email and will have 72 hours to respond with mailing information. If we do not hear from the winner within the 72 hour time frame, a new winner will be selected. Book will be shipped via USPS. TC&TBC is not responsible for books lost or damaged in shipment. 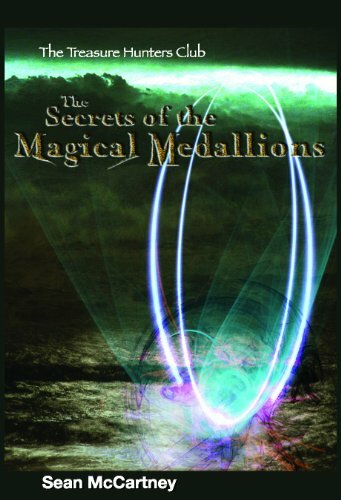 Joining us today is Sean McCartney, author of the young adult novel, The Treasure Hunters Club: The Secrets of the Magical Medallions. Thank you for joining us today, Sean. Can you please start off by telling us a bit about yourself? 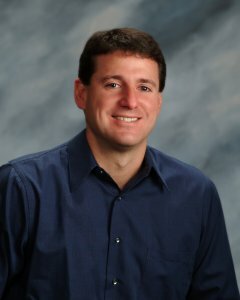 I am currently a sixth grade Social Studies teacher at Glenwood Middle School in the Plain Local District of Canton, Ohio. I have always written stories even as a young kid, so it was something that I have always done it just took me some time to be able to write a novel. As a middle school teacher I saw a real need for books that would entertain and help the reluctant reader. We have too many kids that view reading as a chore but I was hoping to change that with The Treasure Hunters Club series. My most favorite part of writing for this group is taking them on an adventure that they could see themselves doing. I think the most difficult part is keeping their attention with so many other things going on around them. The story is about thirteen-year-old Tommy Reed and his treasure hunting club friends who receive a medallion from his famous treasure hunting uncle, “Diamond” Jack Reed, and must find the secret behind it before and ancient evil hunts them down. As I said, I thought it important to have a book series that appealed to the reluctant readers as well as the ones who love to read. Amazon is probably the best bet. With the trouble Borders has been having I am not sure which stores are left. Yes, the website is www.treasurehuntersclubbook.com and you can go there to see some short stories, videos and much more about the series. We are currently in the final edit stage for the second book in The Treasure Hunters Club series which will be released May 7th of this year. The title is Breaking the Beale Code and it is another fun action adventure for the club. Yes, please go and get yourself a copy of The Treasure Hunters Club: The Secrets of the Magical Medallions. It is well worth it. I hate shameless plugs but I had to give one. Thank you for spending time with us today, Sean. We wish you much success.